Dear Players – because many of you wondering what is exactly influencing on provided and received damages – lets explain little general dmg def rules. Explanation: When player will be higher then 5 BP then enemy as first bonus will gain 10% dmg boost, every next 5 BP will get +2% additional bonus. When player will be 500 BP higher then enemy will gain: 10+(498/5*2)% Dmg Bonus – that gives around 210% bonus DMg at max with over 500BP higher then enemy. CURRENT SETTING is for Current Server State where BP on all characters is still on low ranges. In time when BP will be higher, differences will rise – this part will be updated properly to server realm! In game there are more then 1 factor that decides about how much damage player is providing to Players and Monsters. * Gems bonus – Cirtrines %dmg, Beryl-Dmg%. They are boosting BASE dmg and lowering base dmg provided from enemy. Ambers just work as BP change factor. * Skill damage – most skills are in some way Multipliers of %Dmg from base amount. This means if Base dmg of player is 100dmg then skill givng 120% will provide 120 dmg from this skill! * Knights – Dervish can provide 70% DMG bost on Base Damage, Guardian can provide -70% reduction on damage on total DMG received from enemy. * Battle Power (BP) – this factor is multiplier of Total Damage. 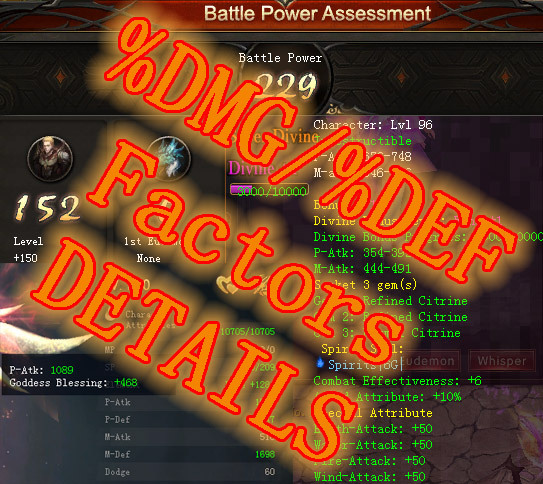 Means will provide DMG Boost from all sources together, same as Def – dmg reduction from total dmg taken. This means BP is affecting TOTAL DMG and DEF on player while rest % bonuses affecting dmg from stats. Similar is about DEF Boost. When player receive 95% DEF bonus for being 110 BP higher at current settings – then this 95% is covering TOTAL Dmg that is receiving (meaning if you gain 70% reduction from guardian – BP def boost will provide additional % reduction from Dmg that will be given after guardian bonus given. Example: player getting 100 DMG as base. When use Guardian – will receive 30 dmg (after 70% reduction). Then if player have 95% (max) bonus from BP as well will receive 30×95% reduction = 1-2 dmg is what will get in the end only covering all % bonuses! This means player Must put attention to ALL factors and plan properly tactic. Battle Power Is important – but as long player stats wont be properly cared – % bonus will not do much of effect anyway! PVM is not working exactly same as PVP – to be clear under this. There are NO additional damage from BP anymore when hunting monsters like in old days. Whats left is just % Bonus to DMG given monsters depending on how bigger BP player from monster as well how much % more dmg player will take when is at lower BP amounts. Of course this % bonus apply to player BASE DAMAGE amounts. So if player will wor on patk or matk on all ways – then the base dmg will be multiplied like presented. 0 Comments ON " BATTLE POWER – DMG and DEF % Factor Explanat... "